Jean-Baptiste-Camille Corot, View of Rome: The Bridge and Castel Sant'Angelo with the Cupola of St. Peter's (detail) (1826-7), oil on paper on canvas, 26.7 x 43.2 cm, Fine Arts Museums of San Francisco. WikiArt. A superb plein air painting of this scene on the River Tiber is part of the foundation that Corot laid for Impressionism. Rome, the Sant’Angelo Bridge over the River Tiber, the cupola of St. Peter’s straight ahead, and on the right the cylindrical mass of Castel Sant’Angelo. The sky is blue with faint wisps of high cloud to the left. Sunshine lights the middle distance, on the right in particular, and the far distance, falling from the left (south). The river is broad, its surface smooth and reflective, flowing from the lower right of the painting up and towards the left, passing under the bridge which is slightly to the left of the centre of the paper. The bank on the left of the painting has a series of high buildings, eight to ten stories tall, whose dull walls drop to the water. In front of them are slopes of rubbish, and the bank in the foreground is similarly dark and dull with shade. Between the edge of the rubbish and the left end of the bridge is a small boat, with a man at each end, broadside on and silhouetted. The bridge has three full arches, through which the opposite bank can be seen, bright in the sunlight. There are also single smaller arches at each end. 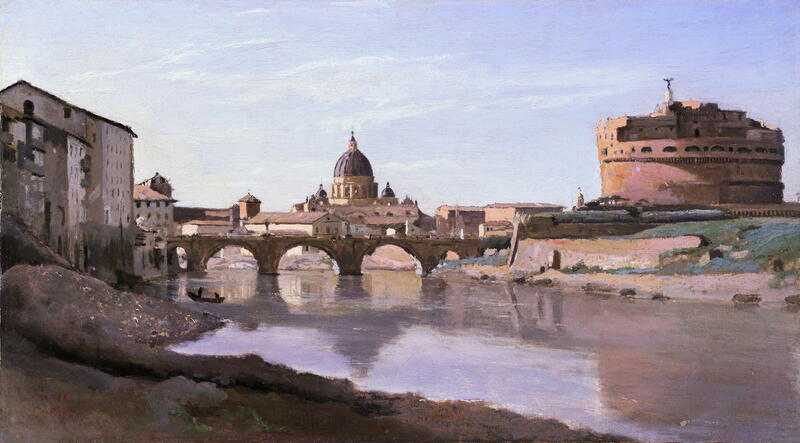 Behind the bridge are various substantial buildings, at the back of which, standing high and proud on the skyline just to the left of the centre of the painting, is the cupola of St. Peters, with a lower and smaller cupola on each side of its base. The opposite bank passes from the (western) end of the bridge in the centre of the painting in a broad sweep to the right edge. It consists of grassed terraces and pale earth, and at its left end (just to the right of the centre of the painting) is the protruding end of the fortifications which enclose the base of the castle. The cylindrical fortified tower of Castel Sant’Angelo is in the upper right, circled by reinforcements at the base of its massive walls, and an overhanging gallery around its top. Various buildings are atop the tower, above which is a dark statue of the Archangel Michael, his wings outstretched, on a tall white plinth. Another small monument is visible just to the left of the base of the castle. The river surface shows slightly blurred reflections of the bridge and buildings beyond, including St. Peter’s, the fortifications along the opposite bank, and Castel Sant’Angelo. The view is taken from the north-east of the bridge, on the ‘left’ bank, probably close to the Piazza di Ponte Umberto I, looking towards the south-west (‘right’ bank). The painting is sketchy rather than finely finished, and appears to have been painted plein air. 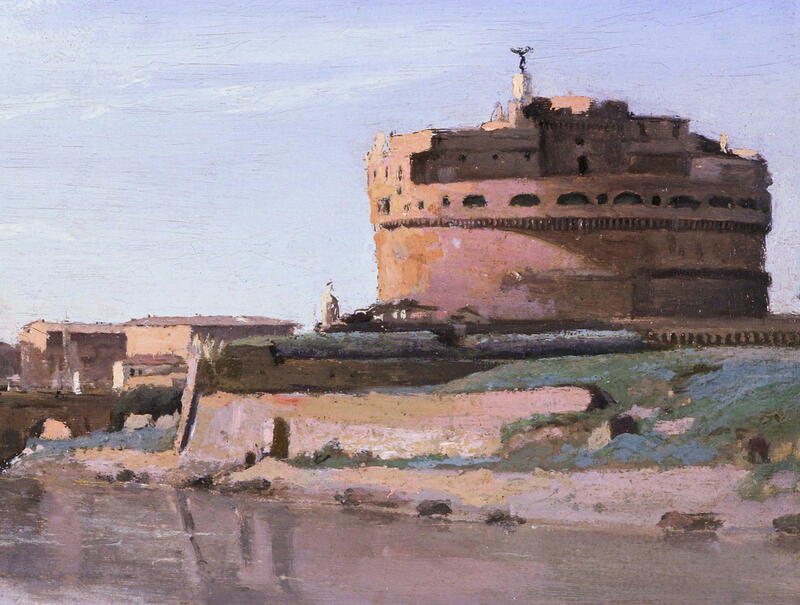 Jean-Baptiste-Camille Corot, View of Rome: The Bridge and Castel Sant’Angelo with the Cupola of St. Peter’s (detail) (1826-7), oil on paper on canvas, 26.7 x 43.2 cm, Fine Arts Museums of San Francisco. WikiArt. 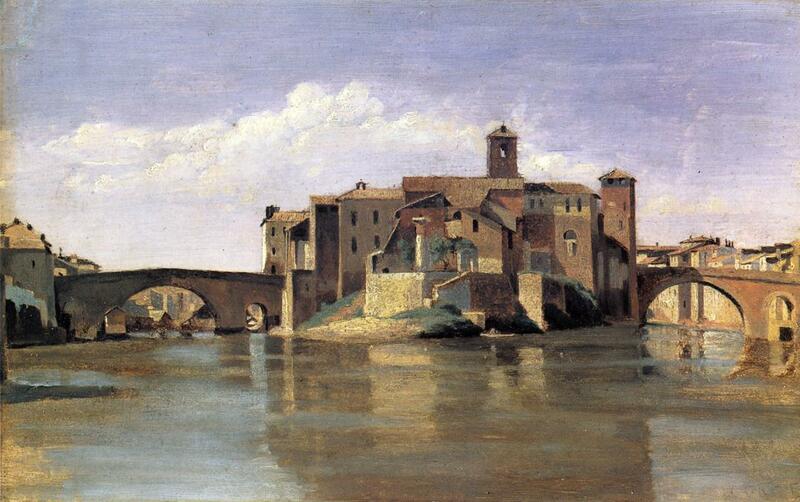 Camille Corot was born in Paris to a middle-class family on 16 July 1796. After an apprenticeship as a draper, he worked in the trade until he was 26, when his father funded him to set up a studio and learn landscape painting. He initially studied under Michallon, but after the latter’s death in 1822, he transferred to Michallon’s teacher, Bertin. He travelled to Italy to paint in the Campagna between 1825 and 1828, during which he completed more than 200 drawings and 150 paintings, mostly plein air. On his return to France he concentrated his efforts on getting work accepted for the Salon, and travelled widely to paint throughout the country. From 1829 onwards he painted for periods in the Forest of Fontainebleau, with the Barbizon School. Although he had paintings shown at the Salons in 1831 and 1833, reception remained cool, and he returned to Italy for further campaigns in Venice and the Roman Campagna. He started to achieve critical acceptance in the 1840s, with Baudelaire his vociferous champion. He was awarded the cross of the Legion of Honour in 1846, and a medal from the Salon in 1848, following which he became a member of the Salon jury, then an officer in 1867. 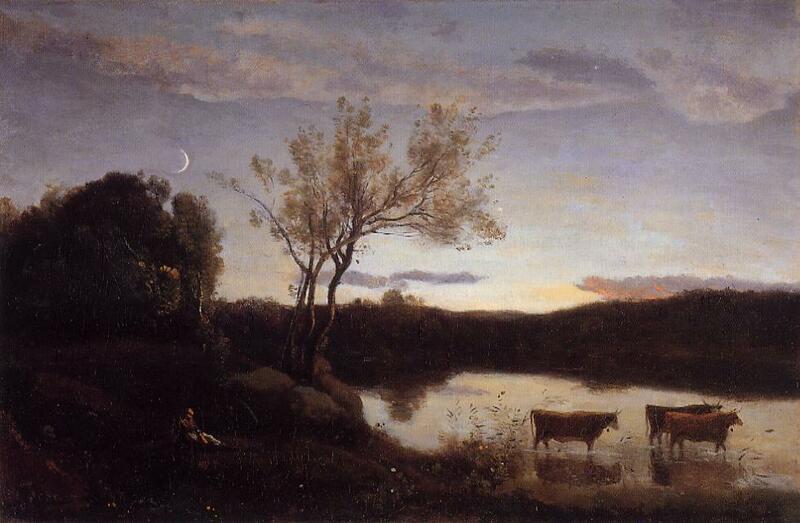 Jean-Baptiste-Camille Corot, A Pond with Three Cows and a Crescent Moon (c 1850), oil on canvas, 35.5 x 53.4 cm, Private collection. WikiArt. Among his many students were Pissarro and Berthe Morisot, and he finally achieved commercial success and recognition as an elder statesman in French art. He gave money in charity to support the elderly Honoré Daumier, the family of Millet, and others. He was awarded a gold medal in 1874, and died in Paris on 22 February 1875. Corot started his professional career as a painter at a critical period, as romanticism and ‘glossy Salon realism’ were reaching their culmination, and he died at the height of Impressionism. Although he never embraced the latter style, his later works in particular remaining less highly chromatic and retaining the darkness of the Barbizon School, he laid the foundations for Impressionism and taught two of the movement’s key painters. His first, probably greatest and most lasting, accomplishment was to build on the tradition of plein air oil painting in the Roman Campagna. This had been established by Pierre-Henri de Valenciennes, Thomas Jones and other pioneers in the late eighteenth century, was handed over to Michallon, who in turn taught and inspired Corot. This is further detailed in my article on the plein air pioneers. Corot’s years in Italy were formative in his own development, and one of the key elements that he put in place to hand on to Pissarro and other Impressionists. Apart from Degas, whose eye problems made it increasingly difficult for him to work in sunlight, all the Impressionists were avid plein air painters, essential if they were to paint impressions and fleeting effects of light on the landscape. 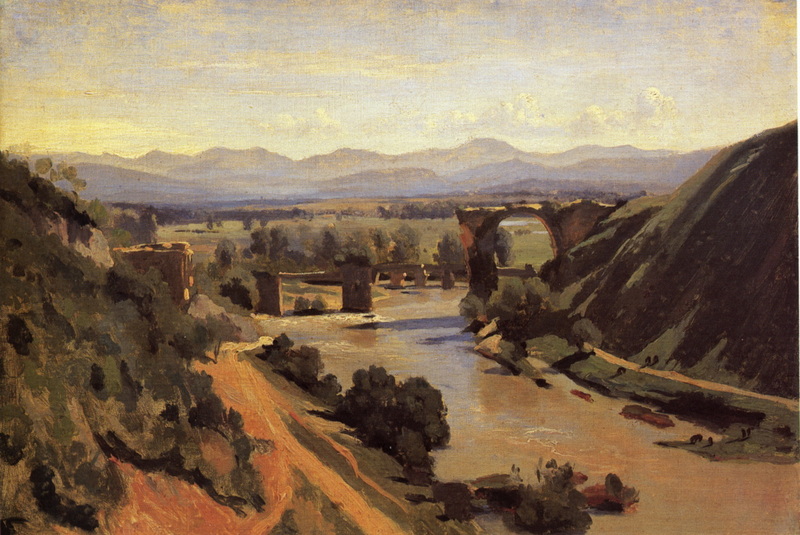 Although Corot’s studio and later work continued to use and depict the effects of light, often to great effect, it was in his plein air work in Italy that he used his highest chroma colours, and portrayed light most overtly, a style which naturally led on to the sketchy, high-chroma work of the Impressionists. 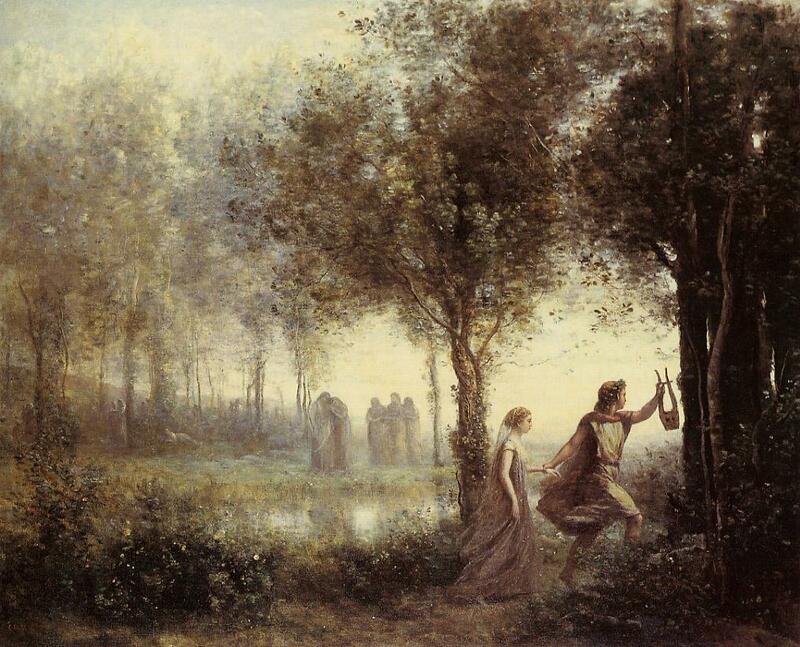 Jean-Baptiste-Camille Corot, Orpheus Leading Eurydice from the Underworld (1861), oil on canvas, 44 x 54 cm, Museum of Fine Arts, Houston TX. WikiArt. He also played a key role in the transition from the Barbizon School style to the early landscape paintings of the Impressionists. This can be seen clearly in the paintings of Pissarro, Sisley, Cézanne, and others during the 1860s. Corot’s own style changed at this time, as he developed his purer and increasingly impressionist ‘souvenir’ landscapes, as well as painting more traditional subjects such as myths. In total he completed over 3000 paintings, sufficient for most to rate him as one of the six greatest Western landscape painters of all time. Jean-Baptiste-Camille Corot, The Island and Bridge of San Bartolomeo (1825/8), oil on paper on canvas, 27 x 43.2 cm, National Gallery of Art, Washington DC. WikiArt. Corot’s earliest plein air works are truly prodigious in their quality, and his development of the art. By the time that the Impressionists were painting outdoors, after 1841, oil paint was widely available in far more convenient metal tubes. 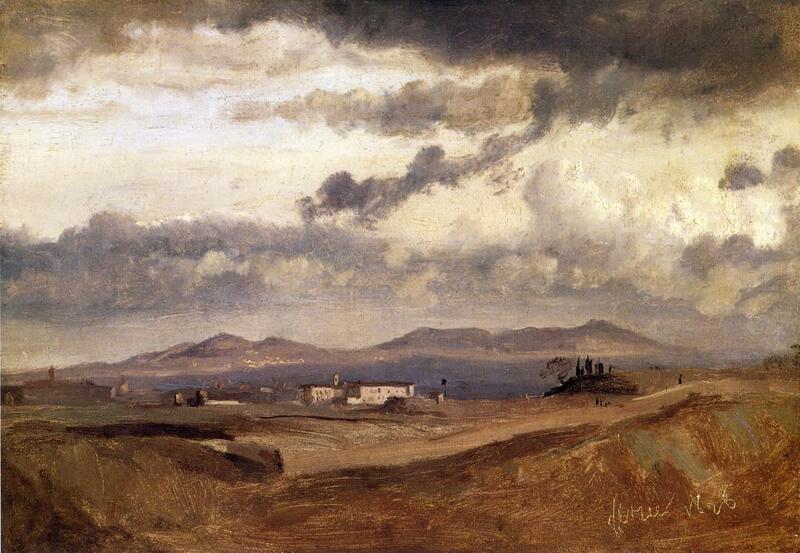 But when Corot was in Italy he enjoyed no such luxuries: paint came in small bladders which were far less portable and much messier to work with. Painting plein air in oils during the 1820s was difficult, cumbersome, and perverse in the extreme. Given that Corot had only started formal instruction in painting in about 1821, to be producing work of such high quality in just five years was remarkable. Aside from the technical issues, a plein air painter has to work quickly whilst the light remains fairly constant, and has very limited opportunity for corrections. Whilst some of his Italian plein air works may have taken more than one session, which can allow time to scrape and rework passages, as he painted on fragile paper the opportunities would have been much more limited than when working on more robust canvas. Great experience is the normal requirement for such successful and expressive plein air paintings, which enables the painter to quickly sketch the motif with accuracy first time round. To have reached such fluency so early in his career is a good indication not only of great artistic talent, but also of enormous technical skill. We are very fortunate to be able to appreciate these astonishing and expressive paintings today, as well as enjoying the effect that they had on painting in the rest of the nineteenth century. 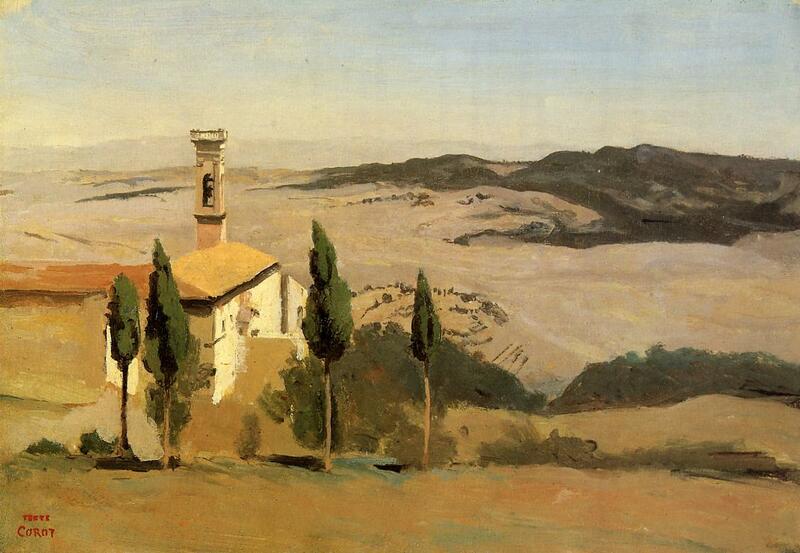 Jean-Baptiste-Camille Corot, Volterra, Church and Bell Tower (1834), oil on canvas (? ), 29 x 42 cm, Private collection. WikiArt. Most of the recent literature dates back to the 1990s and events celebrating Corot’s bicentenary, with disappointingly little since. Posted in Painting and tagged Barbizon, Baudelaire, Corot, Michallon, Morisot, painting, Pissarro, plein air, Valenciennes. Bookmark the permalink.